The all new V-1400 is the latest addition to the Streamfeeder Product Line of High Speed Continuous Feeders. 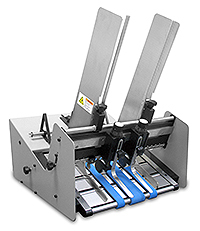 The V-1400 is capable of feeding flat and multi-thickness products into mail production streams consistently at high speeds with exceptional alignment qualities. The importance of straight feeding and minimizing skewing can help improve USPS® MERLIN™ verification results, leading to significant savings for a mailing service company.